When we launched the Lehigh Valley News Group, the Lehigh Valley branch of Berks-Mont newspapers (a Journal Register entity), I served as managing editor for the five new newspapers and the one previous-existing, The Saucon News. 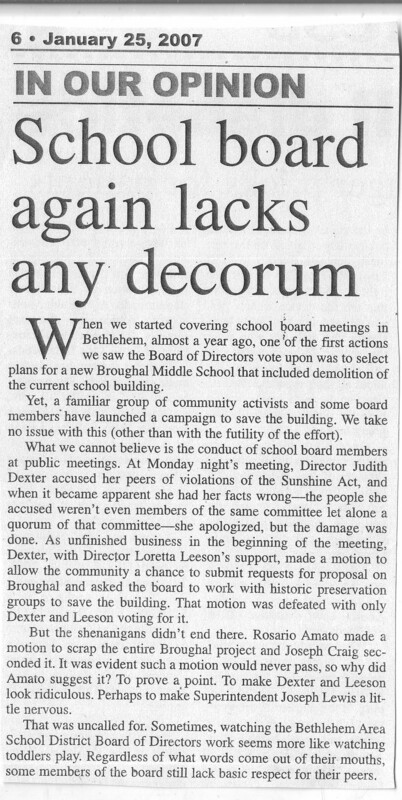 In addition to managing editor duties, I served as editor of the largest of the new papers, The Bethlehem News. We headed into a territory that had been abandoned by my previous employer (Chronicle Newspapers, a division of The Morning Call, a Tribune Company newspaper). In addition to those Chronicle weeklies that had just closed, most of our proposed territories were also served by The Press weeklies, an entity that still continues today. I attended the school board meetings of the Bethlehem Area School District. After more than five years of covering the Phillipsburg School District, the differences between the two boards fascinated me. Bethlehem was a larger school district, had more schools and more students. But let’s just say the people who sat on the two boards were also different. I’m sure everyone had their good intentions, but the interactions on the Bethlehem board were often tense. I wrote this editorial after one board meeting where the disagreements between board members, and their unwillingness to move forward after a vote, scared not only me but also drained the color from the superintendent.